About 150 Liverpool fans were left stranded in Britain when an airline cancelled its flight to Athens hours before the Champions League final. The Jet Time Airways flight was the last of 37 flights scheduled to leave Liverpool for Athens on Wednesday. 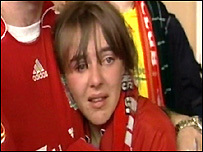 The flight, due to take off at 1215 BST, was cancelled due to technical problems, leaving fans devastated. 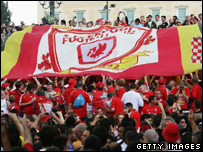 About 25,000 Reds fans are at the AC Milan clash at the Olympic Stadium and thousands more line the Athens streets. Those without tickets have been urged by police to stay away from the stadium and watch the match in local bars instead. About 8,000 people flew out of the Liverpool airport in the morning, before the Jet Time Airways flight was cancelled. Airport spokesman Robin Tudor said: "It is particularly disappointing for us as it has been a fantastic morning with a great atmosphere among all the fans travelling to Greece. "Due to unforeseen circumstances the last flight was cancelled and this has left 150 fans absolutely devastated, quite understandably so." A spokesman for Jet Time apologised to Liverpool fans for the situation. "We are obviously very sorry that the football fans supposed to go Athens missed out on an event they much looked forward to," he said. "We extend our sincerely felt apologies to the fans, but naturally safety has to be the priority," he said. Fan Ben Whitehead, a 22-year-old computer technician of Huddersfield, West Yorks, said: "I am absolutely devastated. "I have been crying and I will probably cry again in a minute. I am just trying to hold it in. "I have been to every Champions League game this season and to go to the final was the dream finish but it has been snatched away because of some two-bit airline." Brothers Brian and Alan Hastie, 38 and 42, from Kirkby, Merseyside, both had tickets but had arranged to meet friends without tickets in Athens. Alan said: "It is so frustrating. We are here with two tickets that can't be used and our mates are over there needing tickets." Earlier on Wednesday several fans were stranded at Stansted Airport after an Athens flight was moved to an earlier departure time. Thomas Cook said some of those affected by the changes had organised their own travel arrangements, while others would be transferred to Heathrow flights. In the Greek capital, Merseyside officers are assisting local police, who have 8,500 officers on duty. There has been resentment that the allocations to the two clubs have been 17,000 each in the 63,000 capacity stadium, driving many supporters on to the black market. The British Embassy said staff had distributed 10,000 leaflets giving advice on what to do if fans encountered a problem. British Ambassador Simon Gass said: "British football has a great reputation, it's a wonderful export for us in many ways. "I think the Liverpool fans will come here and be good ambassadors." In Merseyside, police are warning that fans should take care in busy pubs, bars and restaurants. Ch Supt Andy Ward said: "Two years ago the majority of supporters were good humoured and well behaved, this year we're hoping the fans will again make the city proud." Before kick-off, fans were queuing outside pubs in Liverpool city centre to find a space to watch the game. Six people have been stopped from leaving the UK in the ports and airports operation designed to stop troublemakers flying to Athens. Two were stopped at John Lennon Airport and four were stopped at Dover for alleged possession of forged tickets.